winter visitor, originally uploaded by jahansell. If we leave the porch door open, sometimes we return to find the porch filled birds flapping around trying to get out through the closed window. 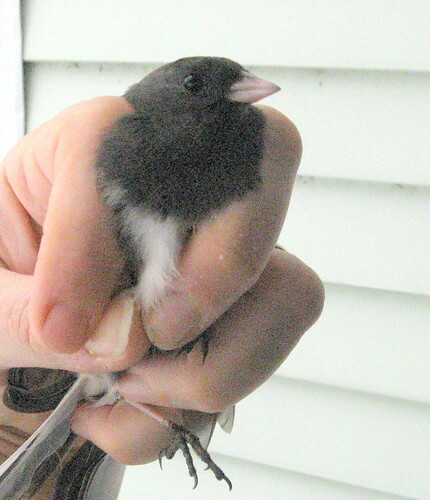 This Junco (and a tree sparrow, I think) were caught this morning. It's pretty easy to corner them and gently grab them - and I can never resist trying to snap a quick portrait. They wait patiently til I'm done, and then fly away, unharmed. I could feel its tiny heart racing against my fingertips. Bad exposure, so grainy - but I didn't want to fiddle with the camera too long! Sweet, sweet, sweet! And fun to see up close.